The aftershocks are dying out now in Nepal and, for most people, the initial danger is over. But there are still thousands living in temporary shelters, struggling for basic necessities. With the monsoon retreating, and in the context of a new political appetite for reconstruction, there is hope that now the country can move forward to a more durable future. One person who has been involved in relief work in Nepal from the very beginning is Ramon Magsaysay winner Anshu Gupta. Gupta, who won the prestigious award for his exemplary social work in July 2015, is the founder of Goonj, a non-governmental organisation that seeks to provide clothing and other essentials to the poorer sections of Indian society. In April, Gupta had led Goonj’s relief efforts in Nepal in what was the group’s first foray into international aid work. In this interview with Ankita Mishra, Gupta speaks about his plans for Nepal, bureaucratic hurdles, and the extent of infrastructure reconstruction that is needed. Raising aid and relief materials was not a challenge, as people in India have faith in Goonj and the work we do. And in times of disasters, there is no dearth of people willing to help. Donations, both monetary and material, came in from all parts of the country, and we certainly appreciated the exceptional quality of some of the materials that were sent in. Nepal has quite a few Ashoka fellows who are doing a good job. Some of them knew us, knew me personally, and the organisation, from earlier. We worked with all the possible Ashoka fellows, in Sindhupalchok, Gorkha, Barpak, Dading and many other areas, and we also worked with many other voluntary aid organisations. Instead of doing it directly, we conducted aid work only through local organisations that were registered before the disaster, as per the rules formulated by the local government. While we did go there, to supervise and deliver aid, we coordinated efforts on the ground with the local organisations. We were able to travel extensively with the help of local communities, although it was particularly risky in some areas. Already tough terrain was made even more difficult by frequent landslides, with many villages completely cut off. Aid was transported to these places through choppers hired by other organisations, and we provided the material to be transported. We told the local organisations not to spend money on material aid since that was something we could take care of effectively, and instead asked them to spend it on hiring choppers so that things could be reached to remote places where aid was needed the most. This system worked well, and served to increase our reach. We deployed 45 fully loaded trucks of absolutely need-based material. Hardly anything has gone there which is of no use to the people or the culture there, because our work revolves around material, so we do understand those cultural and geographical sensitivities. We are a core believer of the principle that you should not give something that people don’t need. We worked with a lot of new sets of volunteers. I think that is really, really beautiful about Nepal. The kind of volunteerism that we saw was unprecedented, and it remained active for very long. The youth were really dedicated and passionate, reaching out to the extremely needy areas, and devoted their full time without worrying about their jobs or their personal safety. This was immensely encouraging to see. We made sure to support these volunteer groups, which are a bit more unstructured than the other more established organisations. But we knew that they were very passionate about helping fellow Nepalis and could reach out to the remote and affected parts of Nepal. The Nepali government needs to be more open to support… there’s lots of bureaucratic hiccups and long series of permissions required. Agencies like ours with lots of resources, we can generate more, and people are willing to provide support, but government processes proved to be major hurdles at times. Initially, our trucks that contained relief materials were stopped at the border and sent to the Nepal Transport Corporation, and accessing our own aid became a huge challenge. Trucks bound for specific areas, and aid designated for particular local organisations, had no surety of reaching the specified destinations unless we actively tracked it. We subsequently posted two of our people on the border to manage the chaos surrounding the clearance of trucks, which ideally should have been streamlined by the local systems in place. Another challenge was getting aid to areas through the suggested system of Community Building Organisations (CBOs) in Nepal’s towns and villages. The CBOs were already inundated with various jobs and responsibilities in light of the disaster. Therefore, it was becoming increasingly impossible for them to handle everything. The most befuddling aspect of the entire ordeal was the fact that we were asked to pay custom duties and tax for the aid we were bringing into Nepal. It is sad if people spend so much of money buying something, putting in so much effort, working day and night, and distributing aid free of cost, but end up paying such huge customs duties at the border, even for aid. How many people will end up paying 20-25% duty and VAT when with the same money you can do so much more? We want to continue participating in relief efforts in Nepal, we want to do a lot, but the process needs to be made easier. Presently, the process is such that you have to first set up an MoU with a local Nepali aid organisation, then get the approval for aid work in certain areas from the local Public Works Committees and welfare councils in Nepal. Once this approval comes through, you have to apply to the Central Board of Direct Taxation (CBDT) in India. CBDT will subsequently send the application to the Indian Embassy in Nepal. The Indian Embassy, on approving the application, will send it to the Ministry of External Affairs (MEA) in India. The MEA will then forward the approval to the CBDT, and the CBDT will finally convey the same to you. The process is so long-drawn and complicated that even if the application comes through successfully, it would have possibly taken three months or longer. In emergency situations where immediate action needs to be taken, this hinders efforts to reach timely help to affected areas. And if any one agency, any one office in Nepal or in India has some kind of objection over a single, even miniscule point, the entire thing will fall apart. When people and countries are willing to send aid, which is very much required right now because it is a large-scale disaster which needs a lot of support to mitigate, the processes involved should be less complicated. It is true, however, that the government officials were quite cooperative in many areas, and certainly all aid work would not be possible without official support. However, the bottlenecks within bureaucratic and government processes need to be removed in order to increase the efficiency of the aid delivery process. And this problem is not only endemic to Nepal, it happens everywhere. “You come and we’ll approve”, simple as this approach is, does not happen anywhere in the world, even during times of disasters. 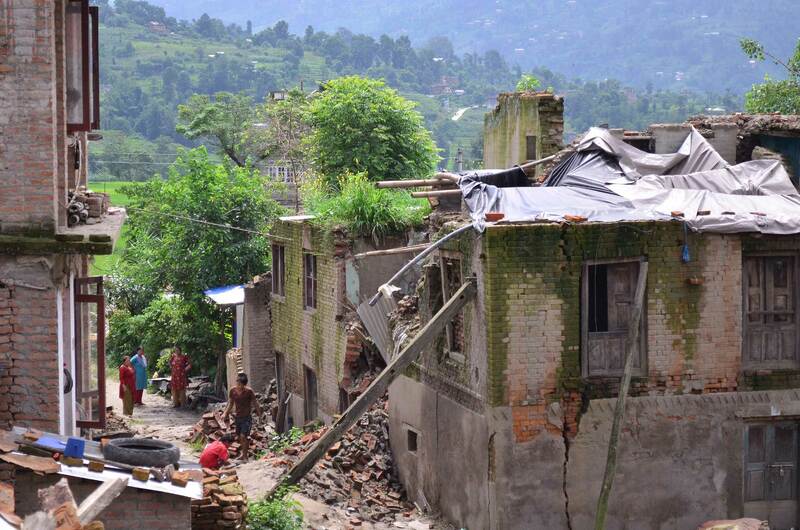 The situation is extremely bad, with many villages having experienced complete and utter devastation. There is very little left in so many areas. Rampant migration and a whole lot of other problems still exist in Nepal. In any case, whether it is India or Nepal, we are not very rich countries; we have rich parts of the country, and then we have large parts that are poor. We need to rebuild houses, schools. Not just infrastructure, we need to rebuild an entire schooling system. Even a single pencil is needed… the disaster is of that level. It has brought everything to zero. Infrastructure rebuilding is certainly needed because until and unless those things are restored, Nepal will take much longer to come back on its feet. However, infrastructure rebuilding is a large-scale operation; the Nepali government, with the help of much bigger agencies, needs to do it. In countries like ours [India and Nepal], we have very resilient people; we learn how to survive. People like us, if we had to stand in the rain for two days, I don’t know whether we’d survive or not, but thousands of people in both countries know how to survive. If you live in a tin shed located on shaky land, you still go to school, you still go to work, you still do whatever you need to in order to survive. The positive thing about the whole operation was that the people of Nepal are very resilient, and their determination to persevere despite all odds was inspiring. It is in times of disasters that the true strength and character of a people are revealed, and Nepal was no exception. India is also a very disaster prone country where disasters like the one in Nepal can, and have occurred. One thing that we need to be really mindful of as a nation is that nothing happens in this country in the name of urgency. We tend to wait for things to happen before we act. The disaster in Nepal was made much more worse than otherwise due to the faulty and inadequate structures that were built to house people. We must understand the importance of being cautious and acting fast, of being proactive rather than reactive.